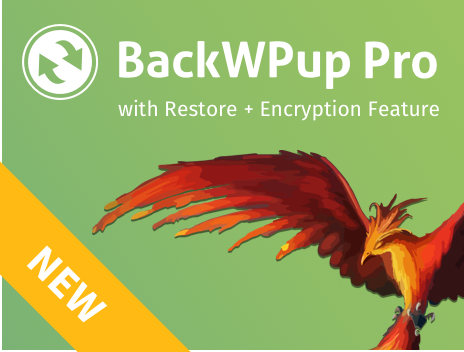 We’re happy to announce the new release of BackWPup 3.4.5. With several bugs being fixed in this version, we hope it will make your experience that much better. So, what’s new in BackWPup 3.4.5? Not everyone has access to the PHP ZipArchive extension. For those who don’t, we now fall back to the WordPress built-in PclZip, which means anyone should now be able to backup using .zip. Previously we were always using mysqldump for database backups. However, on some environments, especially on shared hosting servers, this tool isn’t made available, which would then cause an error when trying to backup your database. This has now been fixed. This has been long in coming, but we will soon be releasing BackWPup 3.5. And with that new release will come the feature that many of you have been asking for: built-in restore functionality. That means that if anything ever goes wrong on your website, and you have a recent backup, BackWPup can help you to restore your website to a previous version. We’re excited to finally have this functionality, and we hope it will allow you to have greater security knowing that your website is protected.